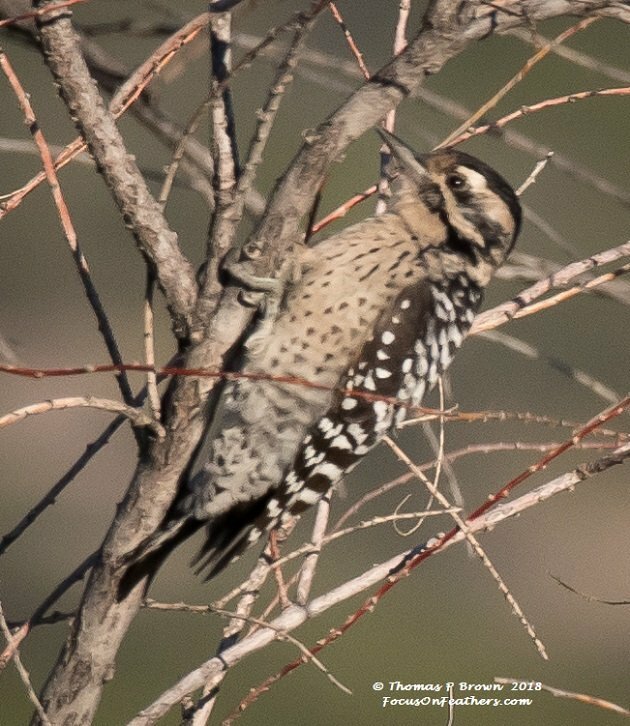 Rarely am I caught too off guard, when it comes to visiting a National Refuge. Most of the time, I know enough about an area, or have done some research into what is found there, that I am pleasantly surprised at best. Not so with our visit to Bosque de Apache NWR in southern New Mexico. The refuge turned out to be 100 times more than I had ever possibly thought it might be, and a place I have vowed to return to, for a much longer visit than I scheduled this time. This 57,331 acre refuge was set aside as a critical wintering location for tens of thousands of Geese, Ducks and Sandhill Cranes. Nearly 30,000 of these acres is set aside as dry wilderness habitat for other birds, animals and other various living creatures. Much like my visit to Malheur NWR, the actual wet Land areas are flooded once the cooperative farming is over. That just happened to be on the very day I was there, and I could see at least one area where the water had been released into the field. With little or no water in the fields, there was not much in the way of waterfowl, with the exception of the year round pond that is maintained, along with a beautiful boardwalk that goes around about half of it. After a quick stop at the beautiful visitor’s center, we made the short drive to the parking area for this water side walk. This shallow pond, turned out to be holding a nice mix of birds, With Great Egrets, Snowy Egrets, at least 100 Barn Swallows, Blue-wing Teal, Cinnamon Teal, Gadwalls, Northern Shovelers, American Coots, Stilt Sandpipers, Killdeer, Long-billed Dowitchers, Least Sandpipers, Spotted Sandpipers, Red-necked Phalaropes, Great Blue Herons, nearly a dozen American White Pelicans, and three American Avocets. 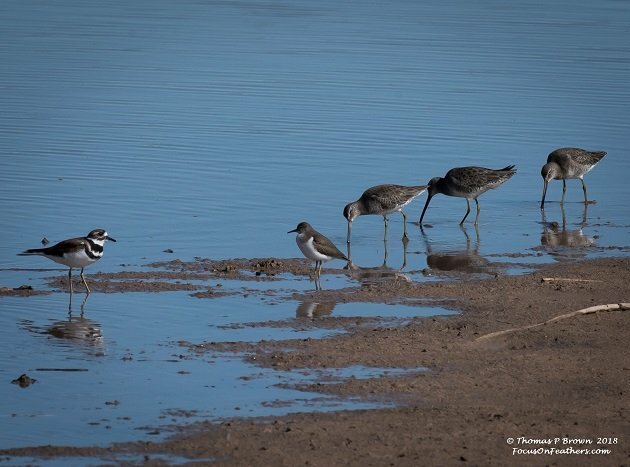 This nice little group of shorebirds, including a Killdeer, three Long-billed Dowitchers and a Spotted Sandpipers all got together for a photo. 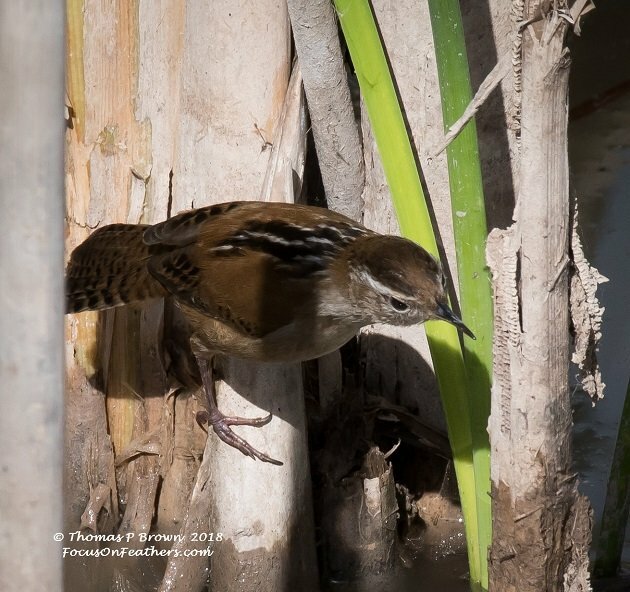 In the reeds and cattails that lined the water, I found this Marsh Wren looking for breakfast. 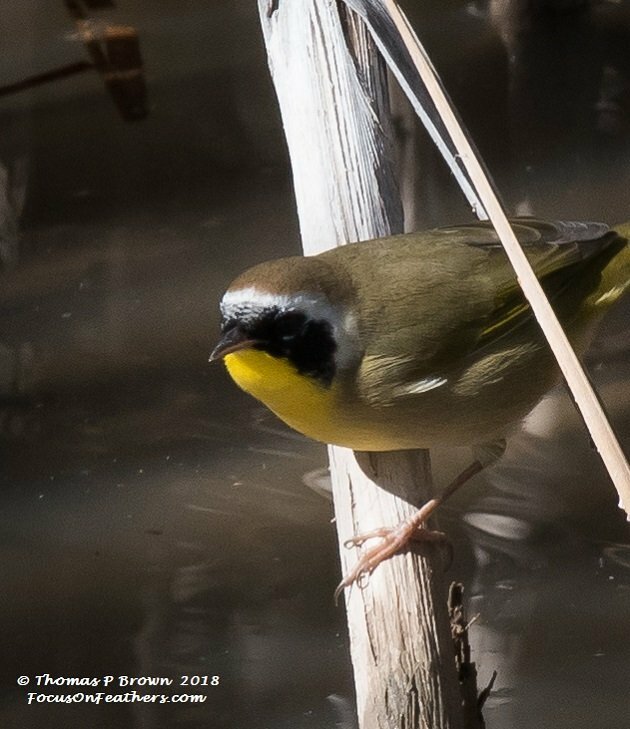 Very near where the Marsh Wren was, I found this Common Yellowthroat. 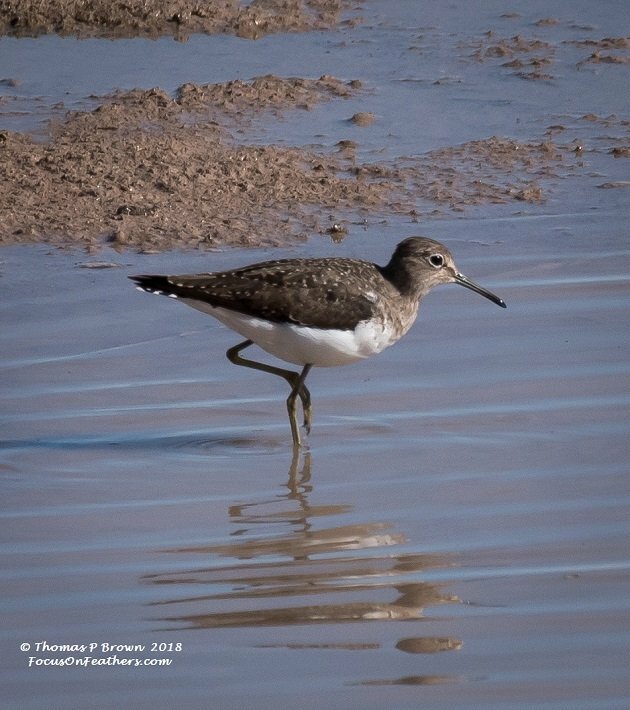 As we were heading back to the truck, this Solitary Sandpiper walked out on a small sandbar. We returned to the visitors center to look around inside, have some lunch, and do a little birding while we there. What a stop it turned out to be, as I got two new Lifers in a matter of minutes. 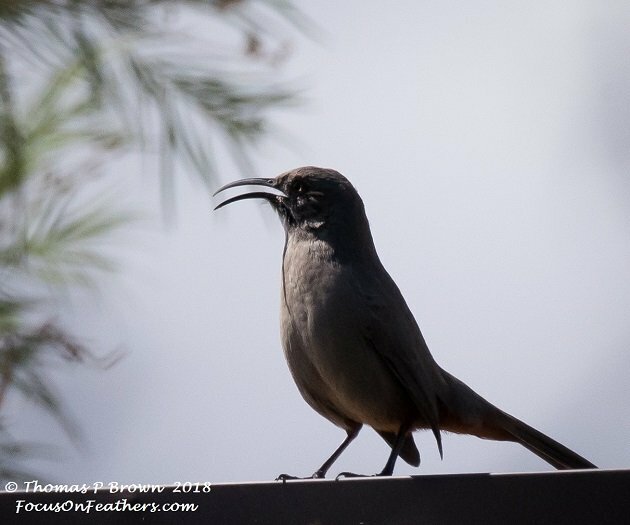 My first ever Gamble’s Quail were feeding right next to the picnic area, and alongside the visitors center building, I spotted a thrasher. Thinking it would be a common Curve-bill Thrasher, I was pretty surprised to find it to be a Crissal Thrasher. 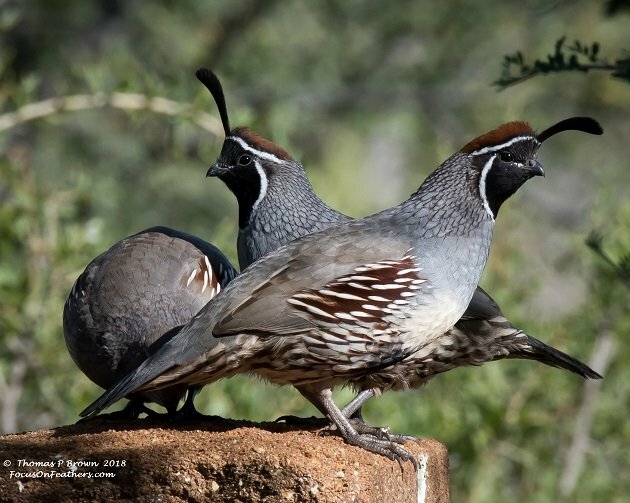 Here is my first ever group of Gamble’s Quail, hanging around a huge feeder block. Despite the backlit picture, here is the new Crissal Thrasher. 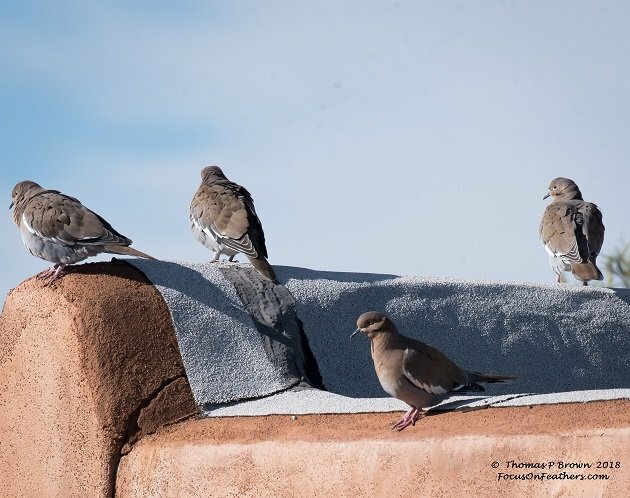 We have returned to the land of White-wing Doves, and there were a bunch of the hanging around the visitor center. 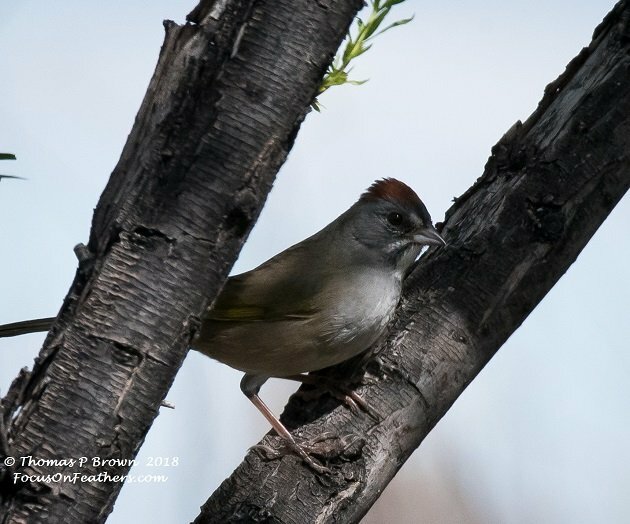 I was surprised to see this Green-tailed Towhee stick it’s head out of a bunch of brush, and then,just a quickly hide again. 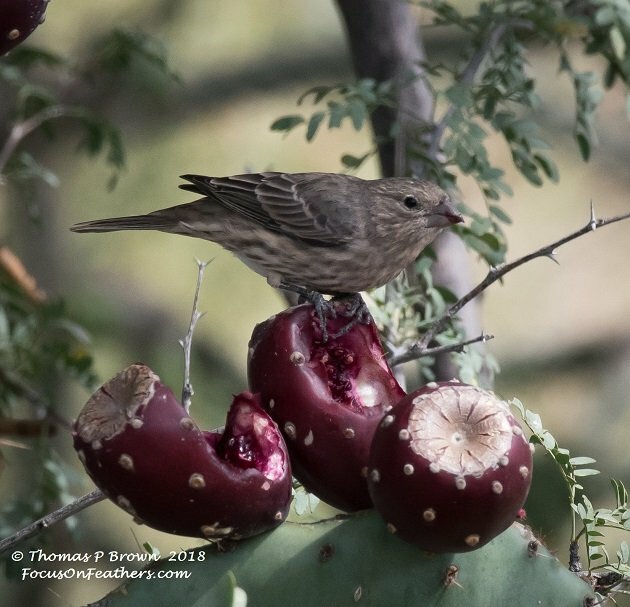 The House Finches were having a great time feeding on the Prickly-pear cactus blooms. The second half of the week was spent near the town of Truth or Consequences, New Mexico. I mean really, how can you not stop at a town that took the name of a TV show, which was written and hosted by a long time friend of mine, Ralph Edwards. In fact I bought my first house from Ralph and Barbra many more years ago than I care to remember. 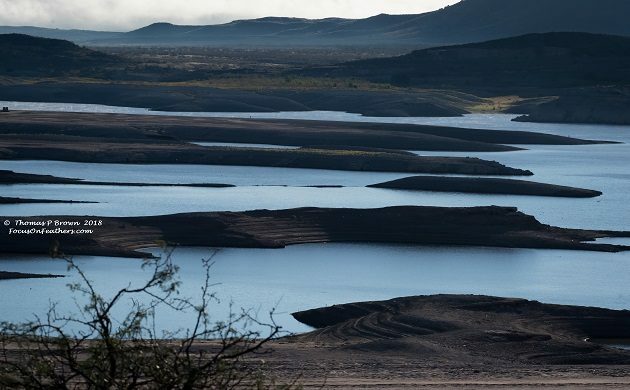 We camped at the Elephant Butte Reservoir Campground, overlooking the lake, with the hopes of finding some more birds in the area. The lake it turns out, was feeling the effects of several years of drought, it is featured at the top of this story, and was at a very low level. 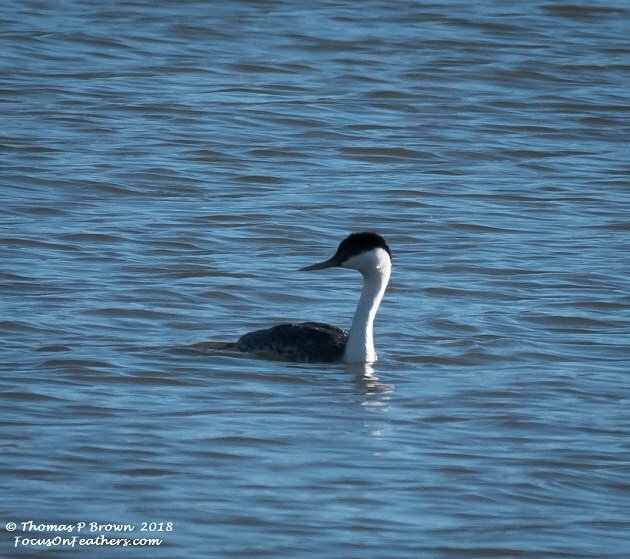 There were some huge numbers of birds out on the water, but dang, they were a long ways away from any part of the shore line that could be accessed. 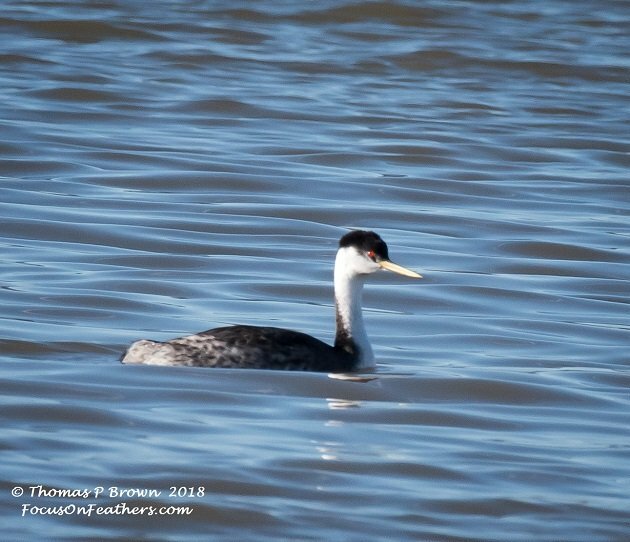 It turns out that the bulk of the birds, after quite a bit of time with my spotting scope, were Western Grebes, with a few Clarks Grebes thrown in for good measure. There was also a small raft of Ruddy Ducks. Here is one of the Western Grebes. And this miserable shot is a Clarks Grebe. Did I mention that they were a couple of hundred yards out there? Up around the lake, and near the dam area, we found quite a few of the more common birds, Great Egrets, Snowy Egrets, Great Blue Herons, Ring-billed Gulls, Vesper Sparrows, Mourning Doves, White-wing Doves, Turkey Vultures, Red-tailed Hawks, Northern Harriers, Osprey, Yellow-rumped Warblers, Orange-crowned Warblers and a couple of Williamson’s Sapsuckers. Early one morning, it was obvious to me that Bosque de Apache NWR should have flooded those fields a bit sooner, as several flights of Sandhill Cranes flew over our location well south of there, at an altitude that should have worried small aircraft. Right in our camp, we found Ladder-backed Woodpeckers. 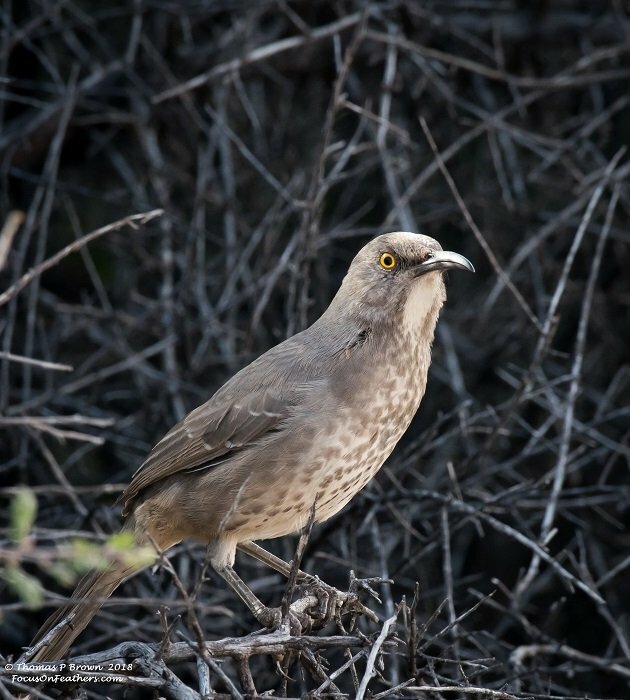 Finally, we also got to see the more common Curve-billed Thrashers. A couple of wrens were early morning visitors. 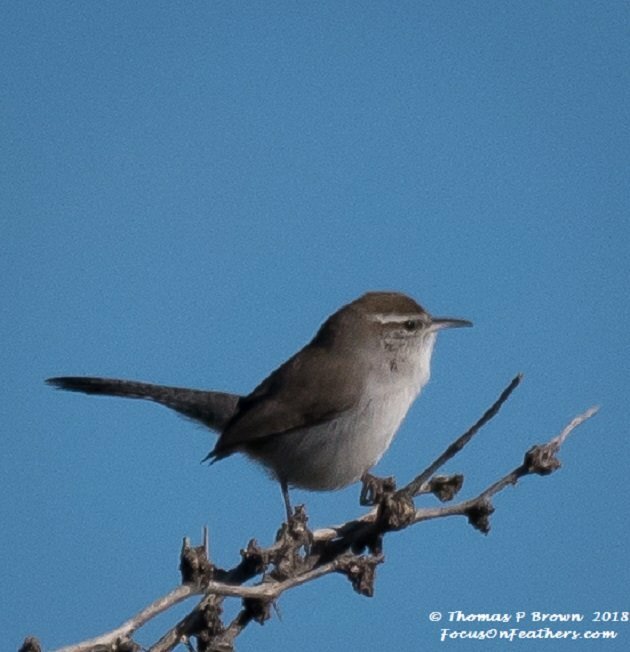 Here is the Bewick’s Wren. 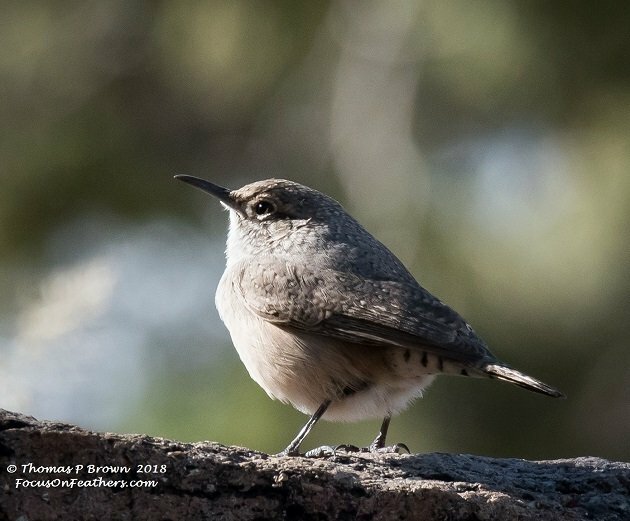 And this is the Rock Wren that was quite vocal first thing in the morning. This marks the last location for us, at least on the road, for this segment of our Little Big Year. We are now headed to Tucson, Arizona, where we will park the 5th wheel for an extended amount of time, possibly as long as March 1st. As many of you might know, we have been on them move, almost every day since February 1st, with 35,000 air miles, almost 20,000 driven miles, 18 airports and 8 different countries. We are tired…..but we will trudge on a bit longer. In about 10 days, we leave for our last (at least up to now) out of the US trip, with 21 days scheduled in Costa Rica. There are a few places left to check out locally before we leave, once we are settled in Tucson. It is almost a requirement to spend some quality time at Madera canyon, which will be about 40 miles from our new Desert Trails RV Park home. The Audubon’s Paton’s Hummingbird Center sounds like it is really amazing, and the Sonora-Arizona Desert Museum, and its surround grounds looking to be another great spot, and this is just the beginning! Stay tuned, as there are still a few more adventures to report on in the coming weeks. I’ve been to Bosque del Apache NWR several times and it is always excellent. 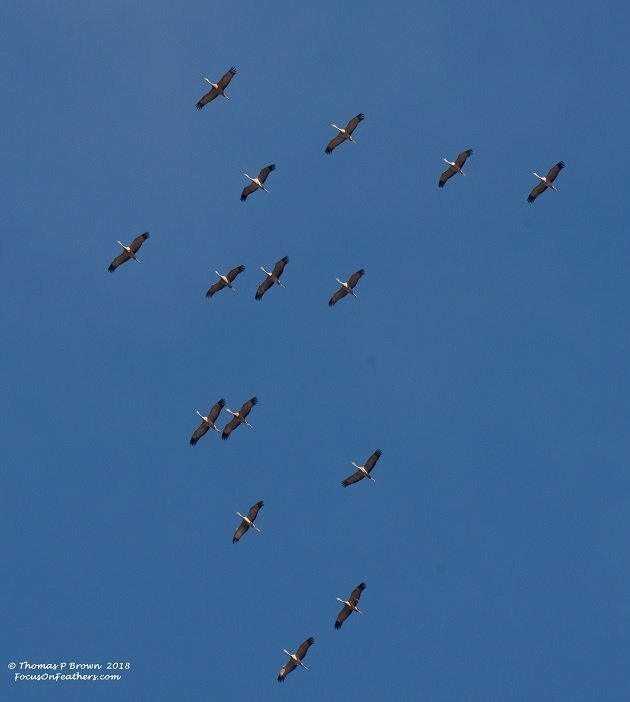 The fly-outs and fly-ins of the Sandhill Cranes and Snow Geese in the winter are remarkable. It was one of my Top 25 NWRs for birding for a reason. And don’t forget Ramsey Canyon Preserve while in Arizona. We were lucky enough to see two Whooping Cranes on November 17th 1989 at Bosque del Apache after camping at the Elephant Butte State Park the night before! USD7 per night in those days! Fond memories! You will easily go beyond 1000 birds seeing as you have not made it to Costa Rica yet!